courtesy Food Should Taste Good. In the process of spring cleaning, we discovered 10 cans of beans at the back of our pantry. It had been a New Year’s resolution to eat beans—nutritious, with plenty of fiber and protein, and affordable—at least twice a week. While best practices involve soaking dry beans overnight before cooking, we knew we were less likely to plan ahead. Hence, a variety of ready to eat, canned bean choices: black beans, cannellini beans, great northern beans, pinto beans, red beans. Garbanzo beans (chickpeas) are also an option, but we eat plenty of them each week in hummus. Here are ways we’ll be using the beans, along with a hint: Drain the beans in a colander and then rinse them well under cold water to remove as much of the sodium as possible. The un-healthful side of canned beans is the amount of sodium in the can. Check out our glossary of the different types of beans. Add beans to a breakfast burrito. Fill an omelet with beans. Make a breakfast tostada: beans mashed with ground cumin, heated in the microwave, spread on a tortilla and topped with scrambled eggs and salsa. Include as a side with other eggs or breakfast foods. Have bean soup with your salad or sandwich. Top green salads with beans to add flavor, protein and texture. Mix them into chicken salad, egg salad or tuna salad. Use kidney or other red beans to add color and nutrition to potato salad or macaroni salad. Have a two-bean or three-bean salad with a sandwich. Combine one can each of different beans with chopped onion, bell pepper and cilantro or parsley in a citrus vinaigrette. Add beans to a wrap sandwich. Make pizza: either add beans whole as a topping, or mash them spread on the crust before adding sauce. Extra nutrition points for a whole wheat pizza crust! Add beans to a Greek or Niçoise salad. Eat chili, with meat or with beans only (vegetarian chili). Add cannellini or black beans to pasta dishes. Top a baked potato with beans and Greek yogurt or sour cream. Top green salads with beans to add protein and texture. As a side: cannellini or other white beans combined with sautéed bell peppers, eggplant, garlic, onion, summer squash and/or zucchini, seasoned with garlic, oregano and a splash of balsamic vinegar. As a main: take the side above and serve over a whole grain (bulgur, brown rice, quinoa, etc.) Add steamed vegetables and another (optional) protein: chicken, fish, tofu. Buy or make bean burgers (veggie burgers). Top with hummus for an extra bean hit. 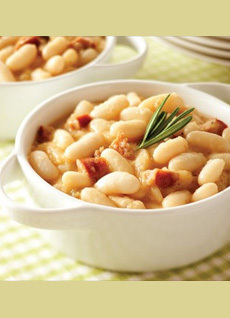 As a side, serve beans with sausage or bacon. Photo courtesy MackenzieLtd.com. 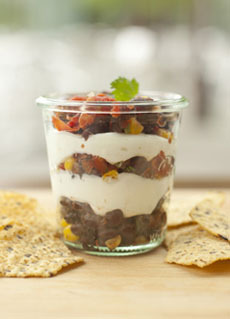 Bean dip with crudités, whole wheat pretzels or tortilla chips. (here’s a recipe for starters). Bean and avocado dip—a bean guacamole (stir beans into the guacamole, or mash the beans with the avocado, plus cilantro). Mashed with the egg yolks in deviled eggs. Baked potato skins with beans. Have more ideas? Add them here!